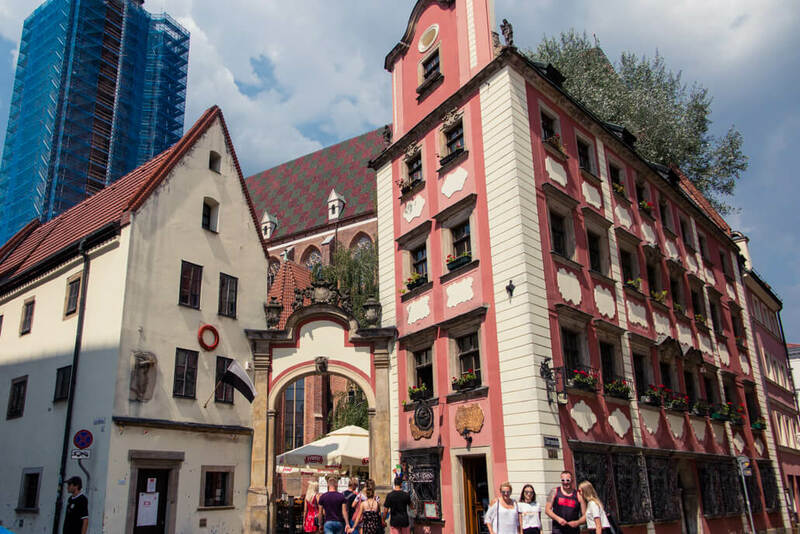 In this article I’ll revive a few of the amazing stories I heard told of Wroclaw attractions mostly located within the Wroclaw Old Town. I visited Wroclaw twice. On my first Wroclaw visit, I went to see my university friend, Gosia. And on the second time, a decade later, I saw Wroclaw (together with Warsaw) thanks to JayWay Travel, a boutique travel company I’ve cooperated with for the past 2 years. 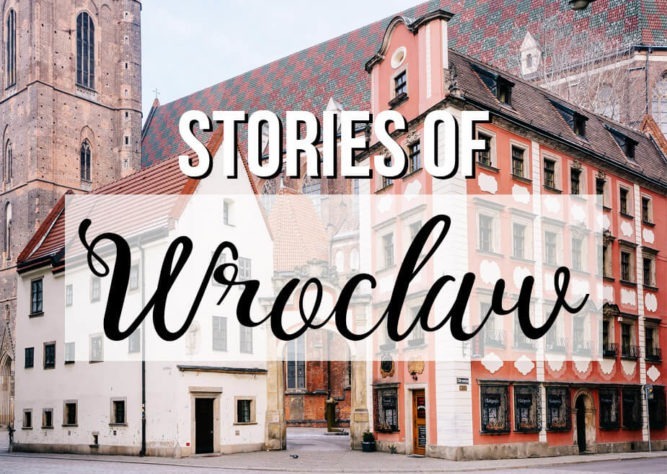 Thanks to the knowledge of JayWay’s guides, my Polish friend and some good old fashioned wandering around, I’ve compiled this post of things to do in Wroclaw that I hope will inspire you to visit Poland’s 4th biggest city and one with a lot of character. In this Wroclaw travel guide I don’t want to just supply you with a dry list of Wroclaw things to do. 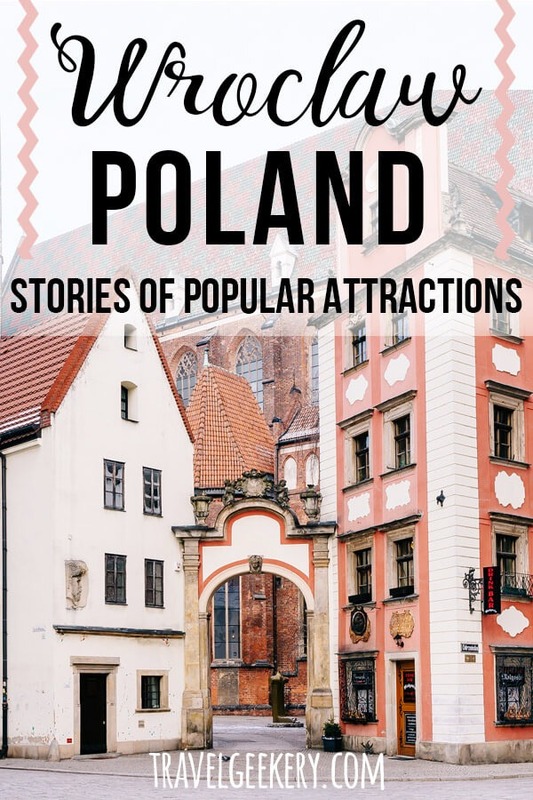 So we’ll look at what to do in Wroclaw through stories of the city’s attractions. In Poland Wroclaw is located in its lower part called Lower Silesian District or Dolnośląskie in Polish. When you look at a map, you’ll notice Wroclaw lies relatively close to the Czech border. 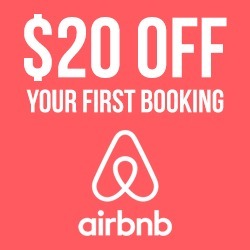 That’s what also makes it quite convenient to visit on a trip to the Czech Republic. 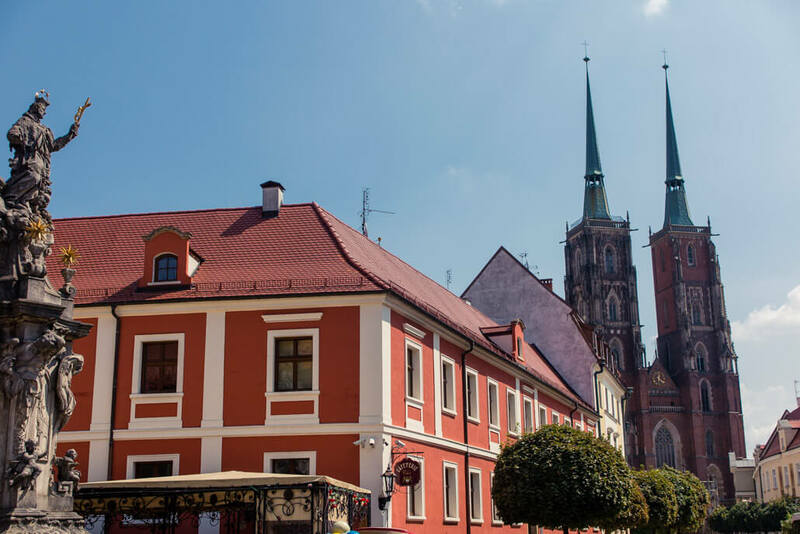 Wroclaw belonged to different countries throughout the last 600 years from being a part of the Czech lands to belonging to the Habsburg Monarchy to the Kingdom of Prussia, to Germany and finally back to Poland after the Second World War. Back in the days, it was common for local residents to feel close ties to their city, and not so much to the country where it was located.. While today most Wroclaw residents identify as Polish, back then they simply belonged to the city of Wroclaw. Strolling around Wroclaw Old Town at night comes highly recommended! What stories hide behind the main sights in Wroclaw downtown? Let’s explore a few of them. Called Rynek in Polish, Wroclaw Old Town Square is actually the second biggest medieval market square in Poland and in Europe, second only to Krakow. There was a lot of trading going on, since Wroclaw lied on two trading routes and even had a bridge. Before becoming a part of Prussia, Wroclaw was twice as rich as Berlin! And the merchants simply had to all fit there, so that’s why the Square was projected rather generously. Wroclaw Market Square was damaged in the so-called “Siege of Breslau” in 1945. 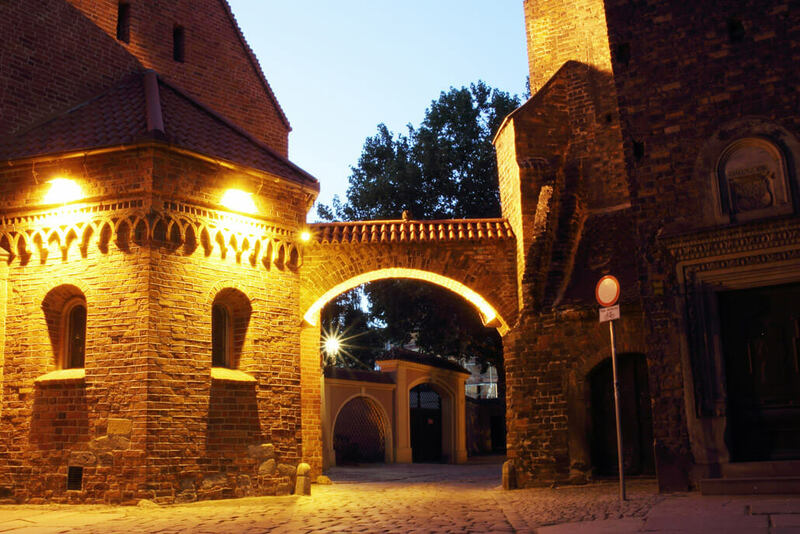 Wroclaw, called Breslau in German, was declared a fortress and to be defended at all costs. It ended up being one of the last then-German cities to surrender, only 2 days before the Second World War was officially over in Europe. 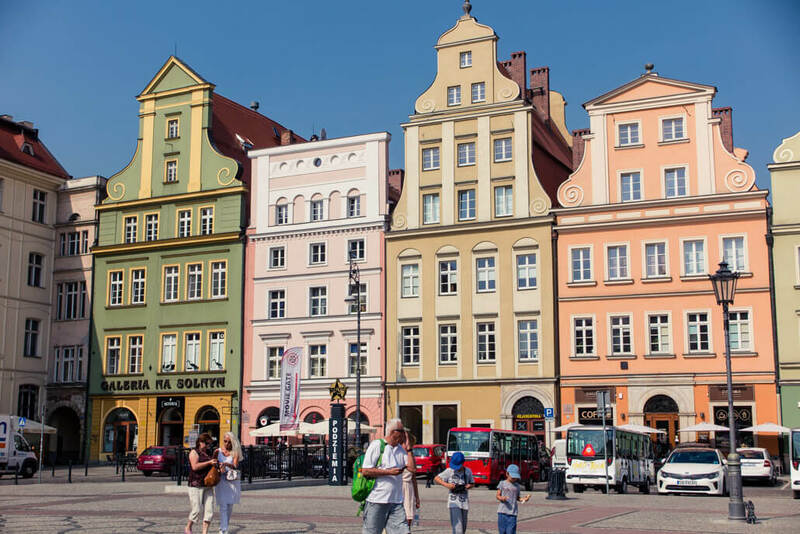 Upon walking onto the Wroclaw Market Square, all eyes are drawn to the building placed right in the middle. Just the sheer decoration will draw the camera out of your pocket while you stare at it with awe. Wroclaw City Hall was started in the 13th century in the Gothic style. However, its construction didn’t stop for another 250 years when more and more parts just kept being added to it. The resulting hodge-podge is a beautiful one, though. Especially the Northern part (the one with the clock), which belongs to the oldest parts of the City Hall. It’s conjoined on the side with the New City Hall (by the Fountain), and then forms a rectangular block of buildings together with residential houses. Look at all the intricate details of the Old Town Hall! 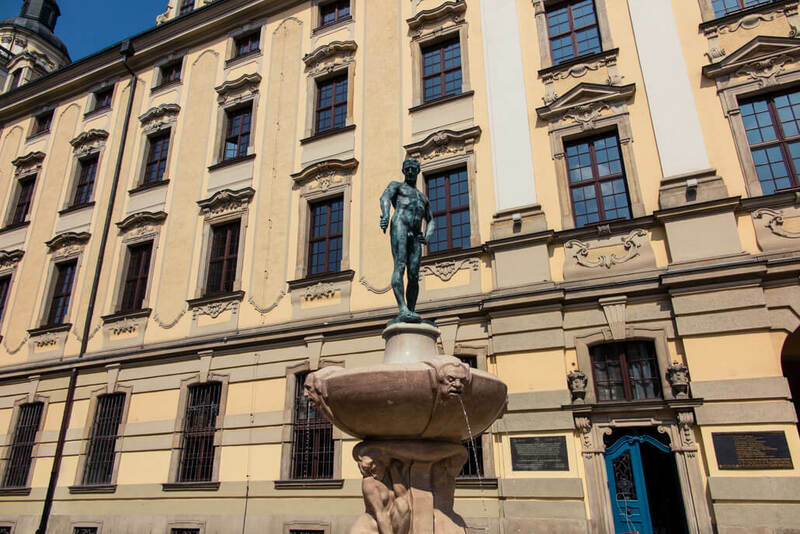 The statues decorating the Old Town Hall façade represented real occupations of the time such as various government functions, artists etc. Their faces are copies of people who lived in Wroclaw at the time. The clock tower bell is believed to be the oldest in Poland, as it was installed in 1368. A strange pillar sticking out of the ground in front of the Wroclaw Old Town Hall is called the ‘Pillory’. It wasn’t a good thing to be chained to. Criminals and offenders would be held here in a cage, whipped, pelted with stones and so on. The original structure was from 1492, but the one standing there today is a copy. In the cellar of the Town Hall, another unique gem hides: Piwnica Świdnicka. It was the oldest pub/restaurant in Europe, being established in 1273. Back in the 13th century, beer was safer to drink than water. Seriously, even children and the elderly drank it. The alcohol percentage was way lower than nowadays, though. 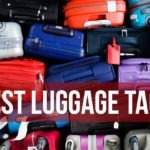 Just about 1 – 2 %. The beer from Piwnica Swidnicka was exported too, since it was one of the best quality beers in the Medieval times. The actual brewery was located across from Piwnica Swidnicka, in the tenement house Under the Golden Pitcher (house no. 22). In the 16th century a tunnel was constructed from the brewery to Piwnica Swidnicka to allow for an easier transportation of the beer. Nowadays it’s used for storage purposes. When in Wroclaw Poland, famous people like Goethe, Chopin, Picasso or Copernicus would come here to Swidnica, drink the beer and be merry. Unfortunately, you cannot visit the restaurant since it closed down permanently in 2017. You can, however, visit the Wroclaw City Hall grounds. The Old Town Hall houses the City Museum of Wroclaw. No matter how long you are in the city for, the Old Town Hall belongs to Wroclaw top attractions. In the corner of the Market Square the space opens into yet another, smaller, square: the Salt Square. It got its name from the salt that was traded here in the Middle Ages. 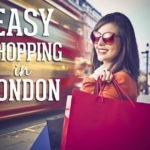 But it wasn’t just salt – also other expensive articles such as beeswax, leather or honey were sold here. 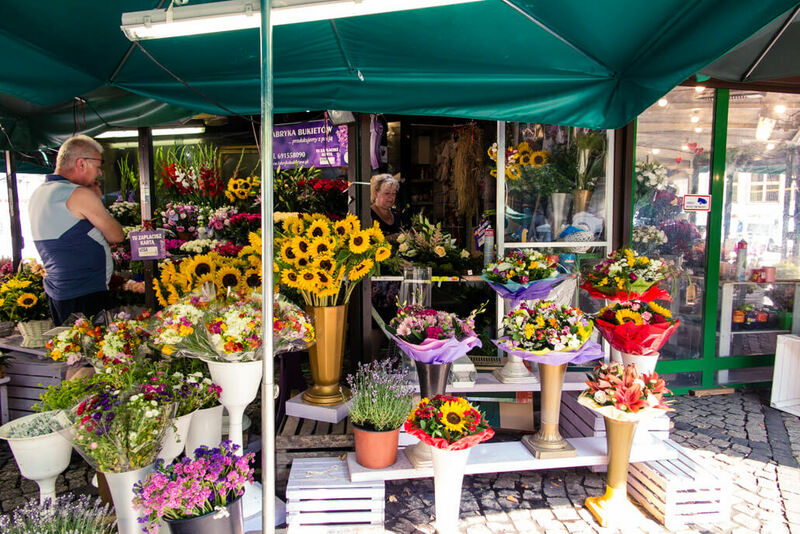 Nowadays the Square serves mainly as a flower market that stays open late into the night, some stalls even 24/7. Wroclaw men definitely have no excuse not to get flowers for their girl. Don’t expect a huge flower market, though. This one is made up of just a few stalls clustered together in the middle of the Salt Square. Look at the prime pieces of Wroclaw architecture lining the Salt Square. Could you tell that most of them are reconstructed and are not original? The reconstruction was so successful that you could hardly distinguish which houses are original and which had to be rebuilt. Do you want to guess which are original houses and which copies on the photo below? I’ll reveal it right below. Which houses are original and which just well-made copies? The Gothic St. Elizabeth Church used to be a protestant church, as Poland was predominantly Protestant until 1945. Originally constructed in the 14th century, this church was prone to disasters, both nature- and man-made. A heavy hailstorm destroyed it in the 16th century and then it burned down in the 20th century. For its construction, renowned Wroclaw families put their funds together and sponsored it, together with rich decorations. There’s only a fragment left from its famous Gothic altar, though. The church offers beautiful views of Wroclaw city centre from its 90m high tower. The climb up is strenuous, though. 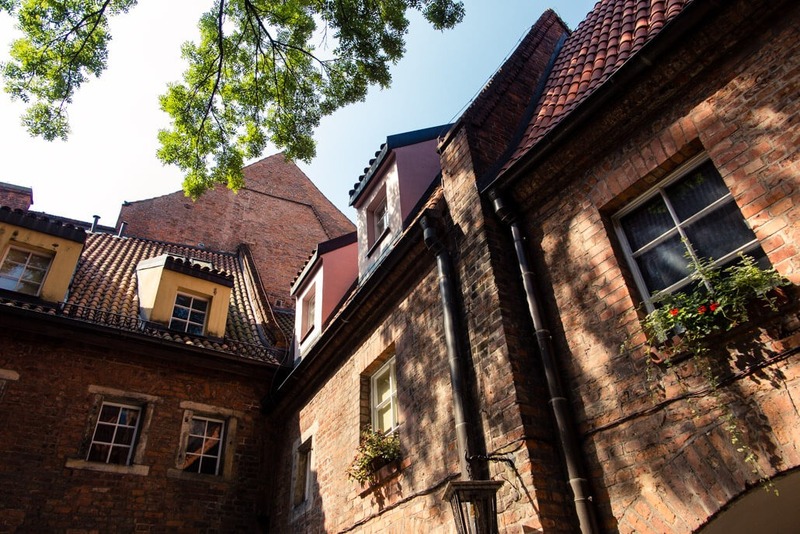 Also the Hansel and Gretel Houses belong to Wroclaw highlights, albeit a bit less noticeable ones if you only stroll around and discover sights without a plan. The two tall houses are connected with a baroque archway, which makes it look like the houses are holding hands. Their nicknames arose after WW2 as a reference to the fairytale by the Grimm Brothers. Don’t be freaked out by the Latin inscription ‘Death is the Gateway to Life’ (Mors Janua Vitae) on the archway – it once led to a cemetery. Another legend is connected to this place, though. Supposedly, right under this archway, a man possessed by an evil spirit, who resided in the above-mentioned St. Elizabeth’s church, murdered his grandmother, and did so in a horrific way (source). In fact, these two houses belonged to a row of tenement houses separating the cemetery from the outer streets. It was the lowest clergymen who lived in them. Only the Hansel and Gretel houses still remain today. When standing in front of the two houses, the prettier one, on the right, is Małgosia (Gretel). There’s a bar located on the ground floor and apart from a few residents, it acts as a base of the Wrocław Enthusiasts’ Association. It seems to be an organization supporting Wroclaw’s cultural life and events. There are often exhibitions held there and thus you can visit the Gretel house. The Jaś (Hansel) house might not be as decorated, but in my opinion it’s the more interesting one of the two, even though you cannot go inside. The Hansel house was inhabited by a legendary local artist named Eugeniusz Get-Stankiewicz. This engraver lived and created in his studio until his death in 2011 and he paid only a symbolic rent. 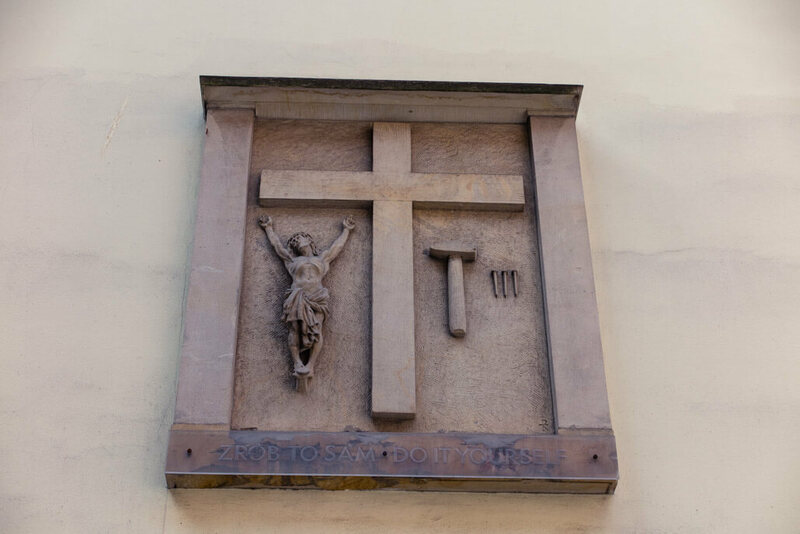 You can see his portrait on the house, as well as a ‘Do it Yourself’ art installation from 1977 featuring Jesus, a cross, a hammer and 3 nails. While the artist got the idea for the piece after visiting a factory where religious artifacts were assembled and witnessing many ‘Jesuses’ being hammered onto a wooden cross every minute, the exact reasons behind are unknown and thus left for the viewer to ponder upon. Among other Wroclaw sights, which shouldn’t be left out (except, perhaps, by strict vegans) is the Butchers Street, i.e. 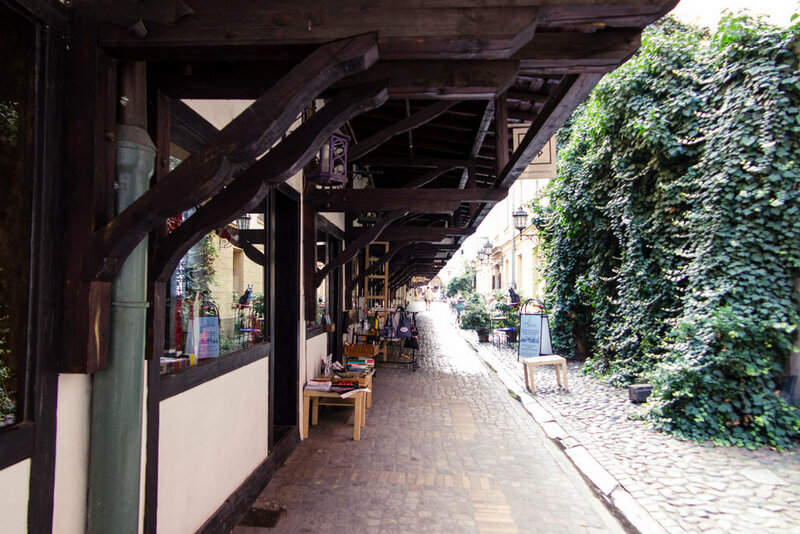 The Shambles. This is the street where the butchers of the city were congregated. Animals were slaughtered here on a daily basis to feed the growing Wroclaw population. If you strolled here back then, you’d see animal carcasses hanging from giant hooks. 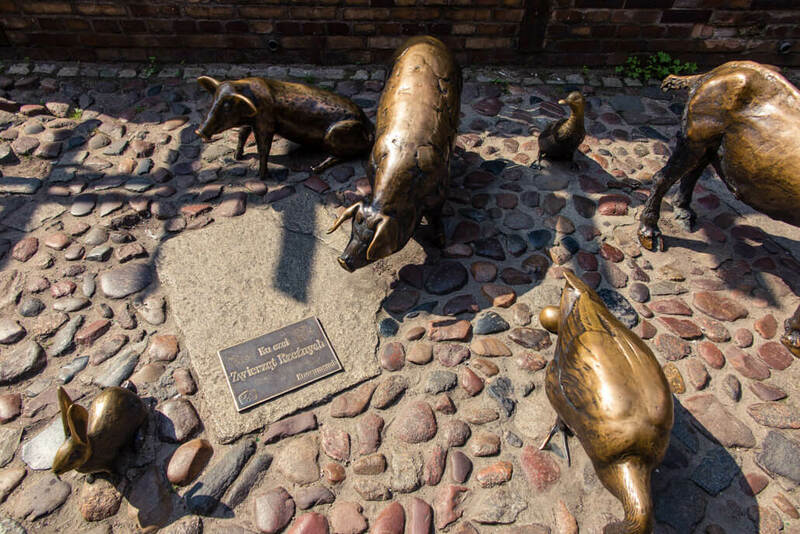 One of today’s more popular Wroclaw attractions, especially among children, is located here – a bronze statue of farm animals including a goose (with a ‘golden’ egg), a goat (complete with droppings), a hare, two pigs, and a rooster. Nowadays Butchers Lane is a pleasant one to stroll through. 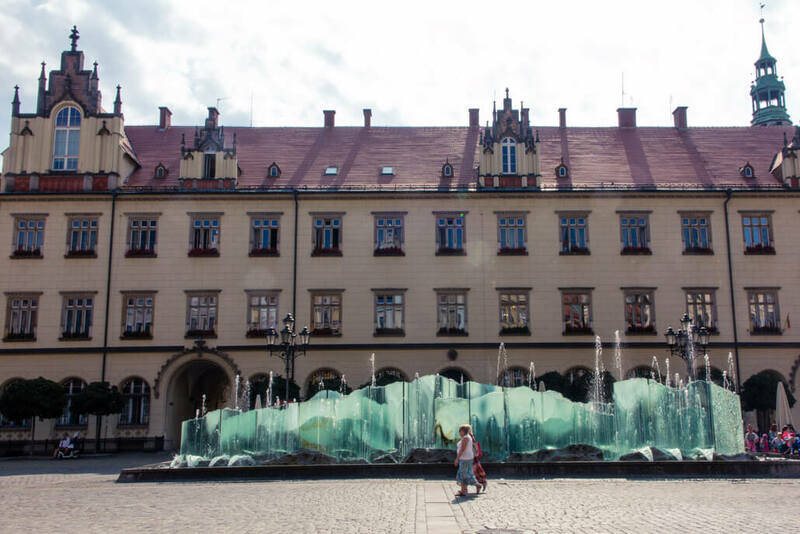 It’s currently lined with small art galleries and souvenir shops featuring Wroclaw glass and ceramics. The Shambles.. now a quaint gallery street. Since you’re in the neighborhood, make sure to walk through the Prison Street too. A large building located on the corner of the Więzienna Street and Nożownicza Street now houses a Polish Academy of Sciences and a ‘hipsterish’ pub called Pracoffnia. However, in the Middle Ages, this building used to represent Wroclaw’s main prison. It could accommodate around 100 prisoners – at least at the time when it reached its largest size in 1733 after centuries of adding floors and additional sections. It was mostly lower class prisoners who were held there. Noble criminals were kept in the City Hall dungeon, as were all prisoners until the second half of the 14th century when this prison was under construction. A famous German (wood) sculptor Veit Stoss is believed to have been locked up for a year in this prison, even though some sources deny that. Due to a bad investment, the artist was trying to recover his money and created a counterfeit bill of exchange, to which he confessed later. He also had a stigma burned on his cheek as a punishment for the crime. In the Prison Street.. There’s only one building that’s dark enough to be a prison. However, some notable students studied there – among them were Alzheimer and Schrödinger. Schrödinger himself (he’s the one who came up with the cat in the box paradox) came to earn 11 Nobel prizes, so that might suggest the Wroclaw University is of a high quality. Wroclaw students actually represent about 15% of the city’s population. Would you like to be a student at such a stunning university building? Notice the highly visible fountain in front of the university building, with a statue of a naked man holding a sword. What’s up with that, right? The man is the author Hugo Lederer himself. He was a professor at the Fine Arts Academy in Berlin at the onset of the 20th century. When a student himself, he lost all his money when playing cards with friends. And not only the money, but clothes too. The only thing his peers left him with was the sword, a symbol of honor. The purpose of the statue is to serve as a warning to the students. But rather than that, the students use the fountain as a meeting spot. A beautiful quiet oasis on the edge of Wroclaw Old Town, Ossolineum is actually an Institute of a great importance in Poland. From the outside, you’ll see just a nice red-white Baroque building. But enter through the metal gate into the garden and you’ll be greeted by a lush green maze enclosed in a picturesque little courtyard. Ossolineum served many purposes in the past, including a college. Today it is, however, a national library and an archive, complete with a research center. 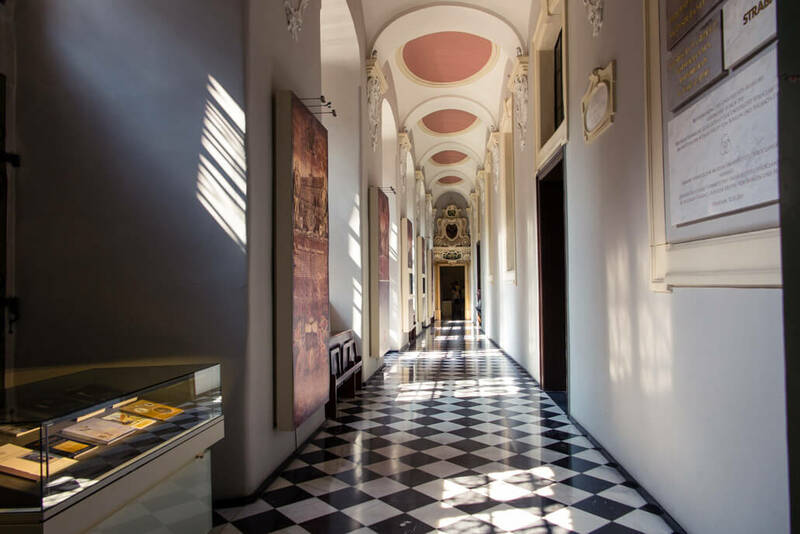 At the time when Poland briefly didn’t exist and Wroclaw’s identity was being shattered, a noble man named Ossoliński realized the importance of collecting national manuscripts and culturally important documents. He ended up amassing a unique collection, thus preserving the Polish culture. That was in 1817. The original place of collection was in Vienna where Ossoliński lived, and later the library was moved to Lviv, Ukraine. The repatriation to Wroclaw didn’t go as planned, as Communists confiscated a large part of the collection, which then had to remain in Lviv. Both libraries are in contact, though, and the Wroclaw researchers have access to all documents of the original library in Lviv. This is where the first Wroclaw settlement started sometime in the 10th century. Later, it was moved to the other side of the river. The Tumski Island, formerly called the Cathedral Island, is separated from the rest of today’s city by Odra, the Wroclaw River. As opposed to what you might imagine, Tumski is not an island per se, at least not anymore. When reaching Tumski Island, you should definitely walk across the Tumski Bridge. 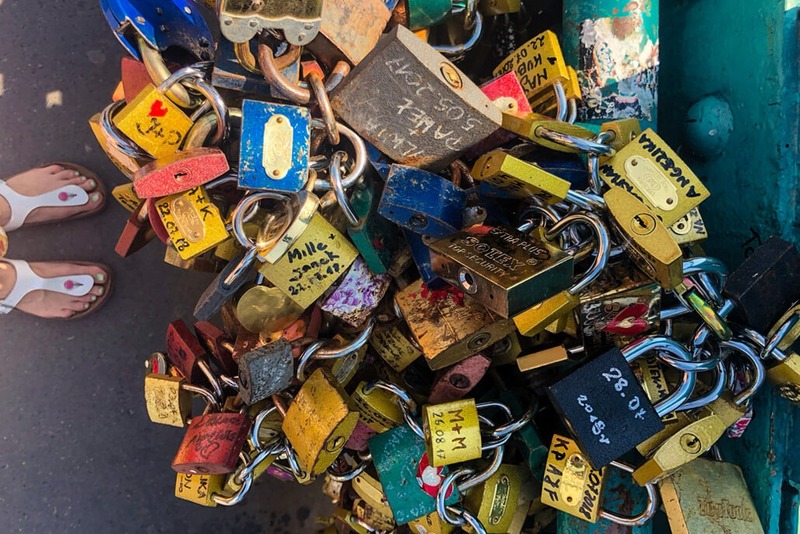 The picturesque bridge carries a large collection of love locks, which look pretty on the steel bridge. The Tumski Bridge thus used to connect the civil part of the city with the religious one. The main churches worth checking out on the Tumski Island are the St. John Baptist Cathedral, which is also the seat of the Roman Catholic Archdiocese, and the “Double Church”. Btw. secret sources also mention that the Tumski Island saw the ill-famed Casanova living in one of the houses in 1766. St. John Baptist Church, built originally in the Gothic style with later Neo-Gothic add-ons, is THE Wroclaw Cathedral. It was heavily damaged in the Second World War – just the front and the back stayed, the rest had to be completely rebuilt. There are 2 statues inside the church that you’ll see right after you’ll enter. Even though they are a bit worn out, you can tell which one depicts a lion and which an eagle. What advice should one give to two rich archrivals who constantly fight over little things, but want their disputes to end once and for all? Once upon a time (in the late 1200s) there was a smart Archbishop, who ordered the two, the Prince Henry and the Bishop of Wroclaw, to build a church together. As it could be expected, there were many things they simply couldn’t agree upon. So they ended up each having their own church built, one stacked on top of the other. 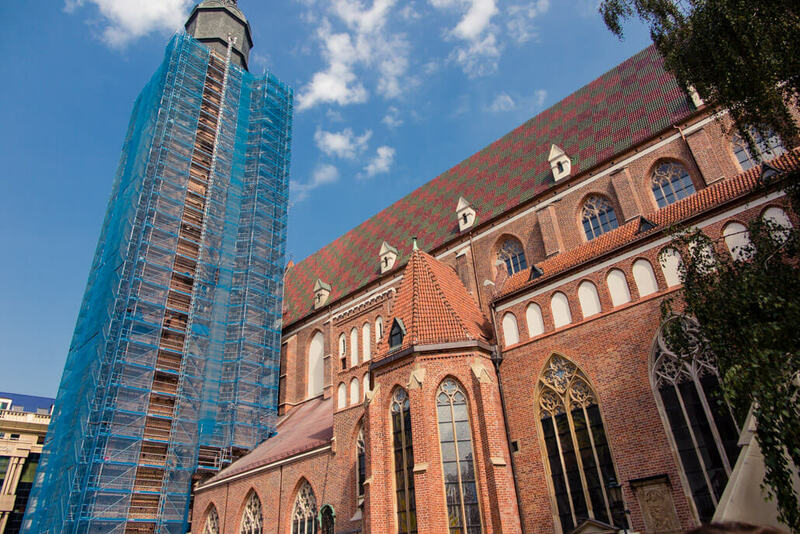 That’s how Wroclaw’s double church was born. The 2in1 church looks like a taller church on the outside, but it has two levels. On the ground floor sits the St Bartholomew’s church financed by Prince Henry, the original name of the church they agreed to build together. The Holy Cross Church by the Bishop is placed on top of it. It’s named after a cross-shaped tree root that was found when the foundations were dug and which the Bishop saw as a clear sign. It is said that in the early 1500s the famous astronomer Nicolaus Copernicus was a scholar resident of Wroclaw’s Church of the Holy Cross for 35 years. He had papal ambitions, but it seems he never made it to even a priest at the Church. His career in astronomy hopefully compensated him for that. If time allows, go have a peak at the St. Giles Church at the Św. Idziego Street – it’s the oldest active church in Wroclaw. You can’t really walk inside the Church other than for the mass, but try to find the little gate right by it. A long time ago there was a man living in Wroclaw whose wife made the most amazing dumplings. He loved the dumplings more than anything else in the world. However, the wife died and he was left alone, mourning his wife and the delicious dumplings she used to cook for him. Then one day, the wife appeared in his dream. She gave him a magic pot of dumplings that would keep refilling on its own overnight, he just had to remember not to eat the last one. When he woke up, the pot full of steaming dumplings was indeed there. He kept eating until there was the last one left. He got greedy and went on to eat the last dumpling. Suddenly, it grew legs, jumped up and ran away. Wroclaw’s Dumpling Gate at night – the ‘dumpling’ can be seen better during daylight. Ok, the dwarfs are so unique that they deserve a category on their own. 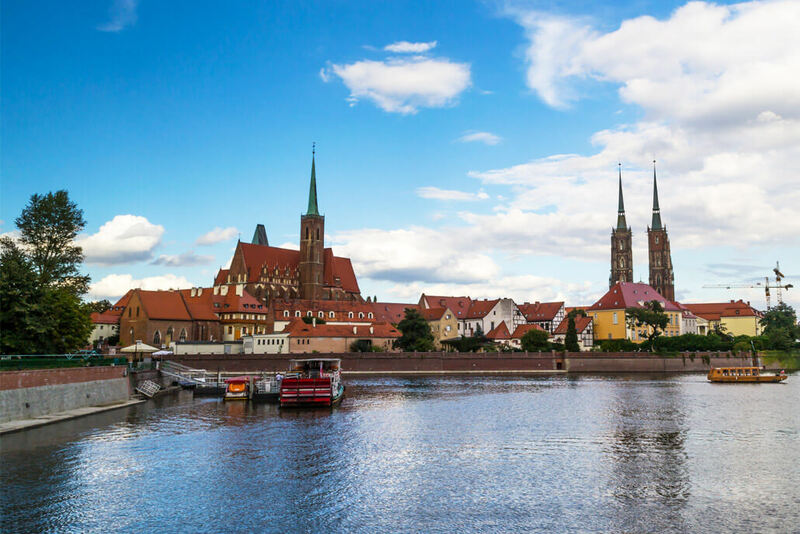 These are actually one of the most sought-after Wroclaw tourist attractions. They too have an interesting story. 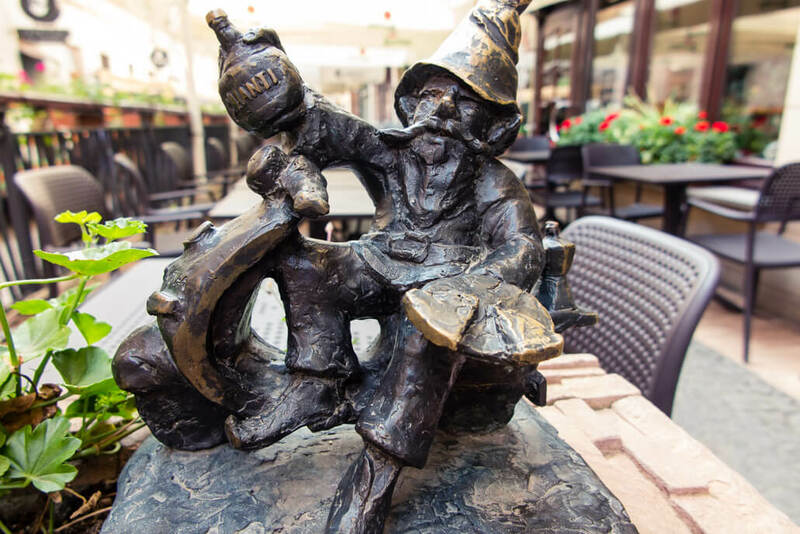 The little bronze statues have decorated the streets of Wroclaw since 2005, but their origins date further back. During the Communist times in Poland in the 1980’s, there was a peaceful opposition movement called The Orange Alternative. Led by students, the protest was to make fun of the establishment via mockery, mostly using painted dwarfs. Anti-regime slogans would see the authorities painting them over, and the Orange Alternative folk would add a little drawing of a gnome. 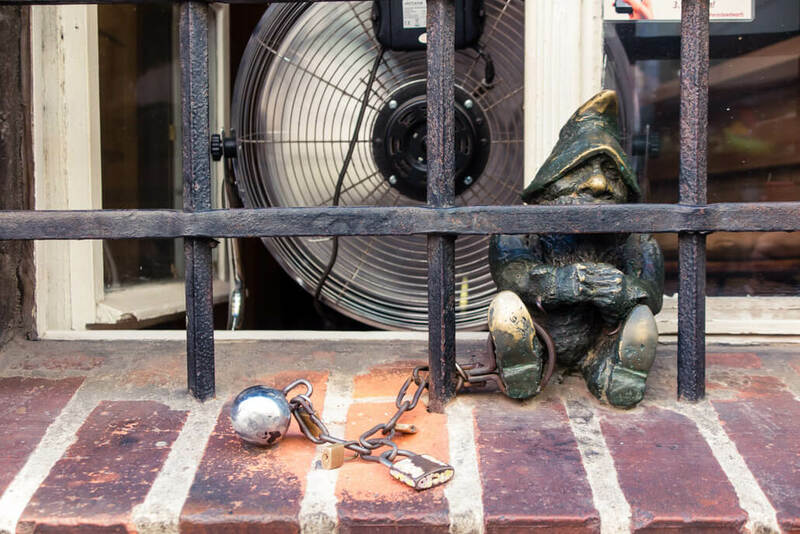 It gained traction and gnomes became a popular symbol of the opposition. 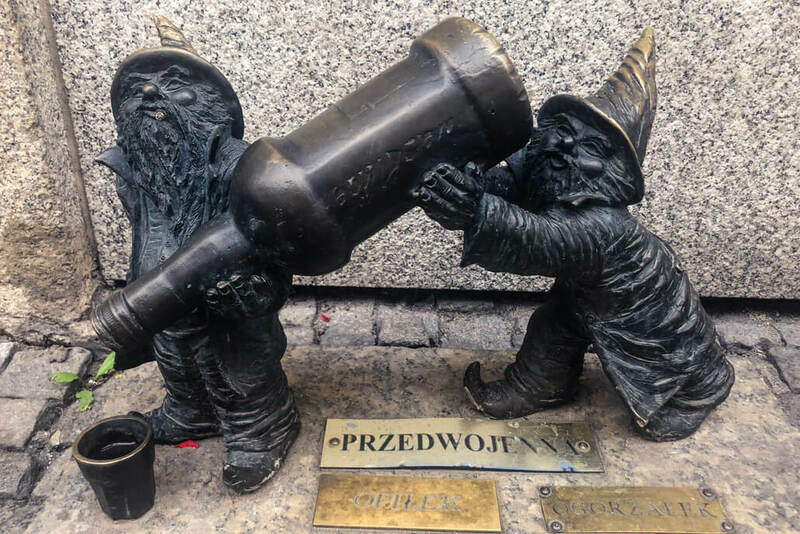 It was only in 2001, however, when the very first bronze gnome was put on the street of Wroclaw – as a symbol (and a little statue) to commemorate the anniversary of the Orange Movement. You can find this first dwarf at the corner of the streets Świdnicka and Kazimierza Wielkiego. That’s one thing our guide didn’t show us, probably because of time constraints. Read more about the Orange Alternative and its dwarfs here. Nowadays there are up to 300 – 500 dwarfs in Wroclaw (the official figure varies greatly) and Android users can trace them through an app called ‘Wrocławskie krasnale’. 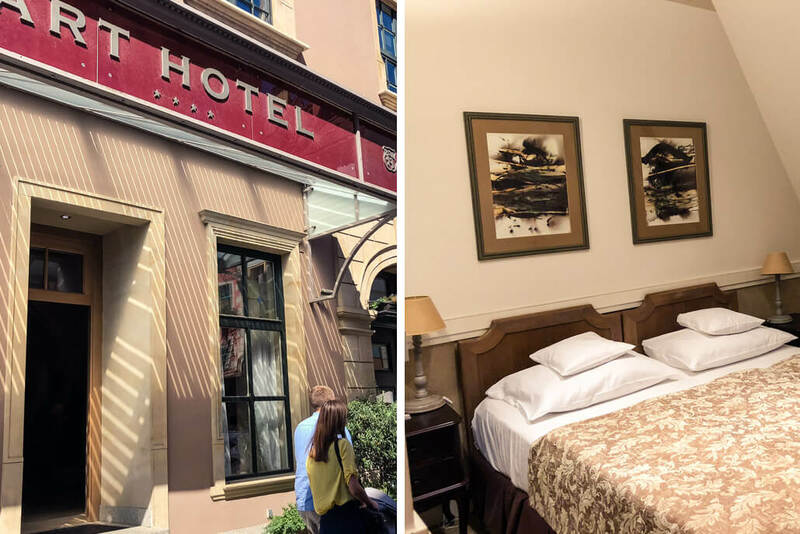 The Art Hotel Wroclaw is a wonderful boutique hotel located just a stone’s throw away from the Old Town. The rooms’ décor relies on a rather traditional look, but is comfortable and cozy. And don’t get me started on the food! The breakfast is exquisite, with plenty to choose from such as the usual eggy picks, to different kinds of artisan bread to a wide variety of fruits and sweets! 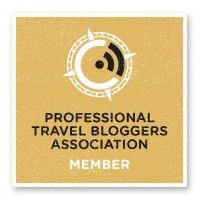 Let me know if you plan to go to Wroclaw or if you’ve already been there. I’d like to know what you thought of the city! 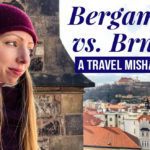 Disclosure: Veronika of TravelGeekery visited Wroclaw on a sponsored trip organized by the boutique tour company JayWay Travel. The opinions presented here are, as always, her own and unbiased.